Ready or not, here come the 2018 midterm elections. Resistance is futile. Even if you don’t want to acknowledge them, aspiring candidates are posturing for statewide bids and vulnerable incumbents are casting votes with re-election in mind. Of course, it’s early. Retirements, primaries, and President-elect Donald Trump’s performance in office will shape the electoral landscape and environment next year. 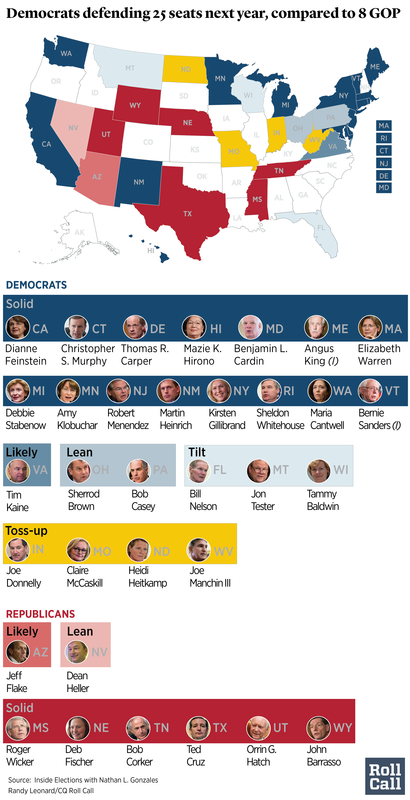 But the initial Senate map is full of Republican takeover opportunities. The ratings are based on the same nine-point competitiveness scale as before; but with two tweaks to the terminology. Races seen as safe for either party are now termed “Solid” Republican or Democratic. Races in play with only minimal risk of partisan takeover are now referred to as “Likely” Republican or Democratic. Here are the initial race ratings provided by Inside Elections with Nathan L. Gonzales.